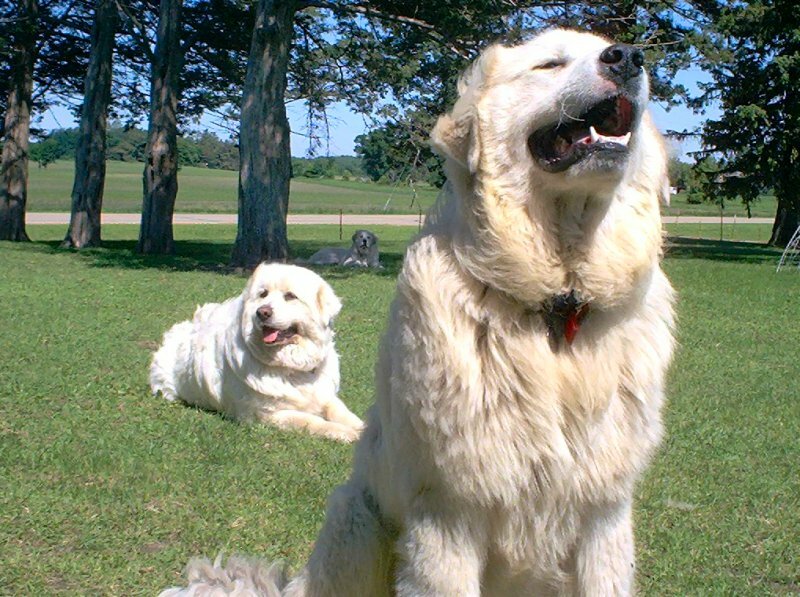 The dogs are all free fed as much Purina dog chow and fresh water as they want. In addition to that, the breeding pair receives special treats of ground meat (usually sheep), or eggs mixed with rice each day. They also enjoy a Brewers yeast and garlic mixture sprinkled on their food. The female will continue on this diet until she weans the pups. This makes for strong well-conditioned females and beautiful, healthy, puppies. A good diet avoids a runt, or a sick, weak puppy. We take good care of the moms and they take good care of the pups. 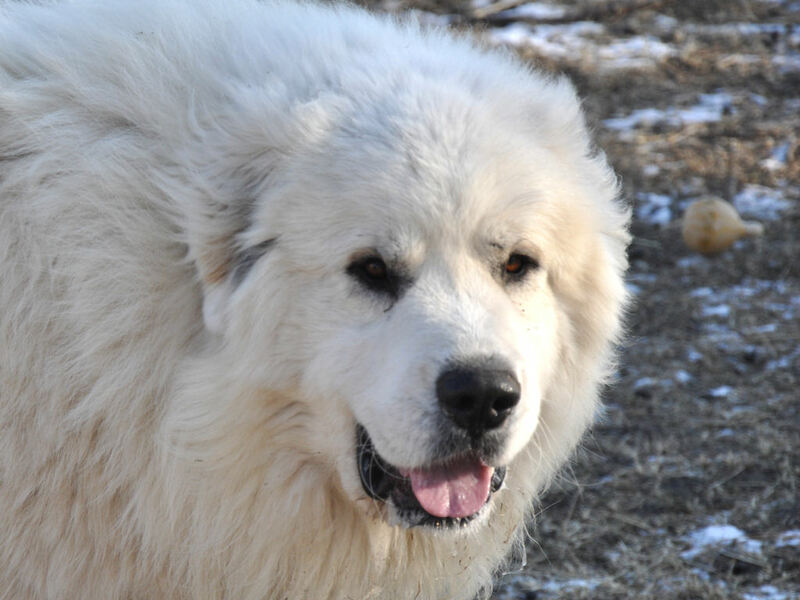 Prince Boaz - Our male Pyr is right at home in the big pasture. 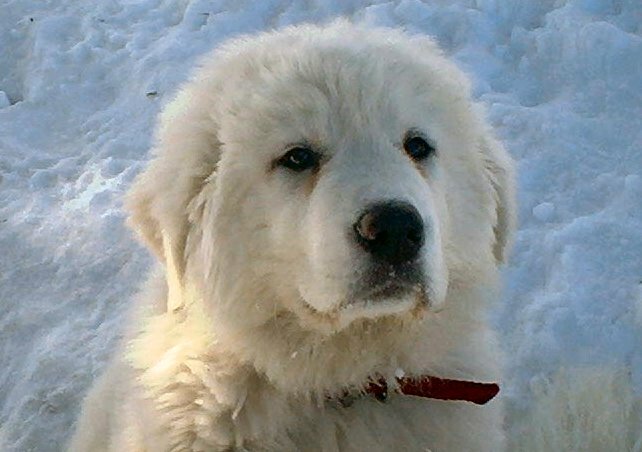 His parents are from British Columbia where they are sheep guardians. 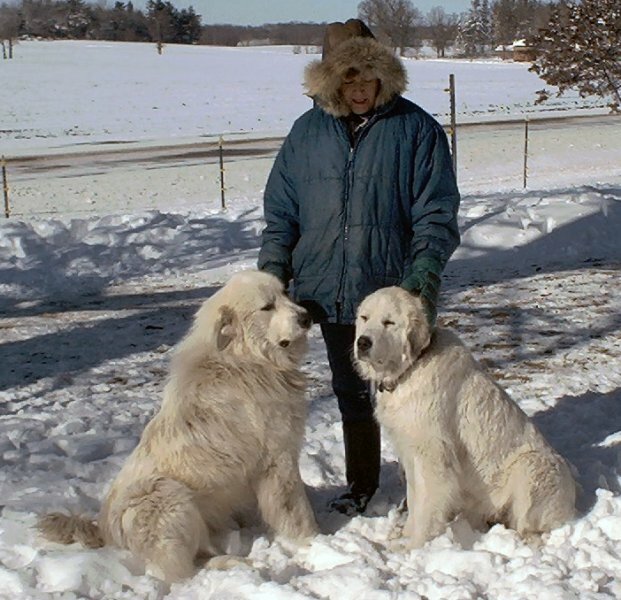 Boaz's future included his own flock and Canadian dog show circuit, but a lost pasture lease meant he didn't have a job and we got him for our farm. He's beautiful and a great guardian! 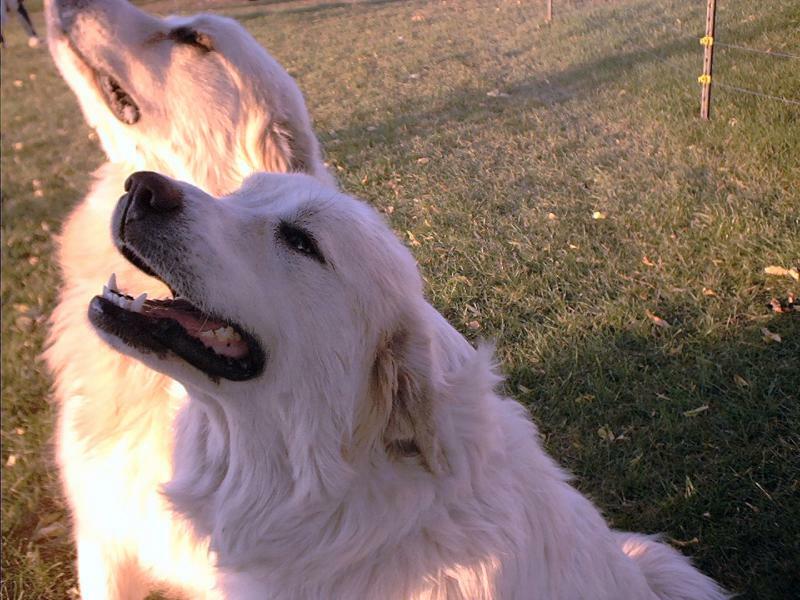 Mocca is the daughter of Ginger, our best guardian. 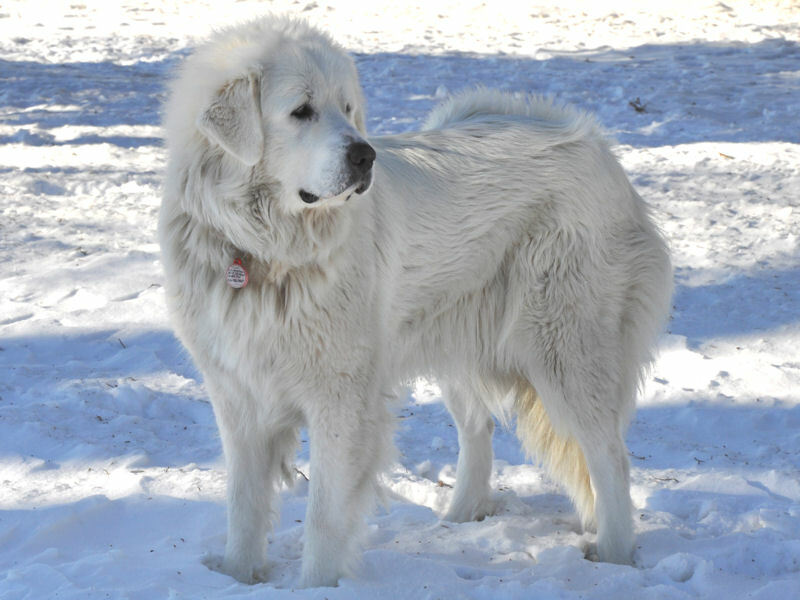 She weighs about 115 pounds and has dark badger-markings around the ears. Mocca is very alert on her guardian duties. 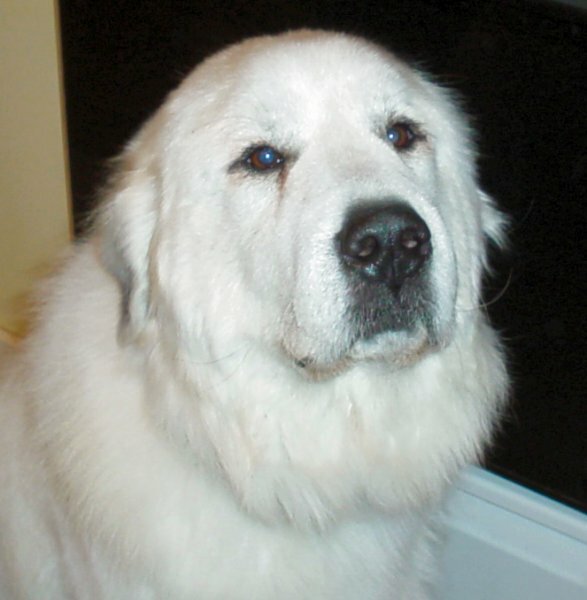 Asher, our largest Great Pyrenees male dog. Asher's parents live in British Columbia. Asher comes from great blood lines, with a long line of champion awards.That explains Asher's good looks. 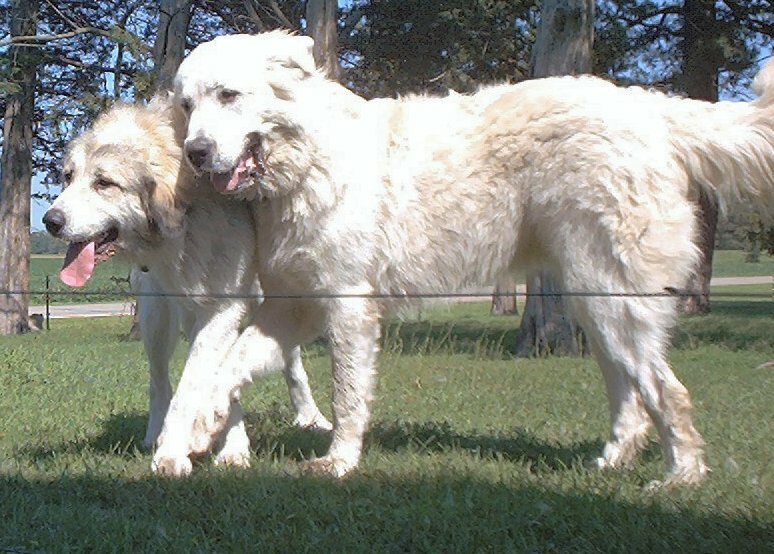 Eventually, Asher will take over Boomer's duties as chief guardian of Milk and Honey farm. 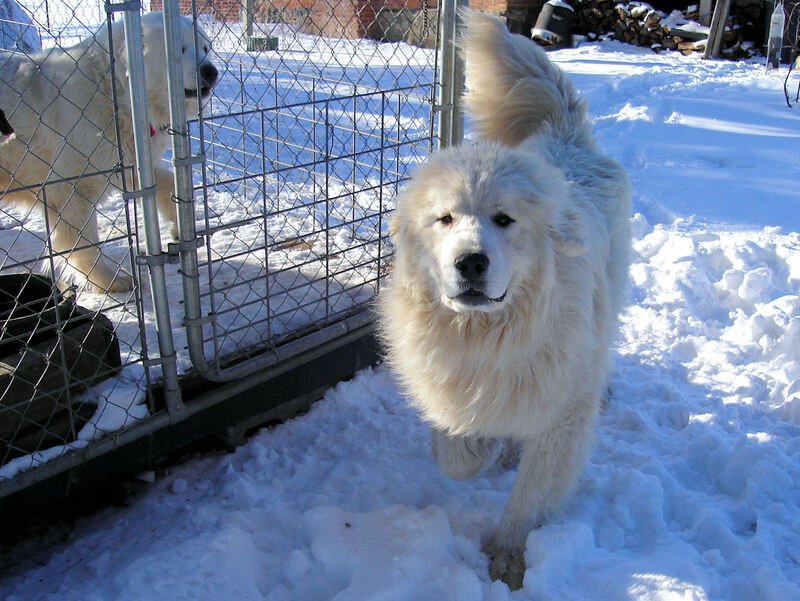 Asher started breeding in the summer of 2006 and we have great expectations for him. 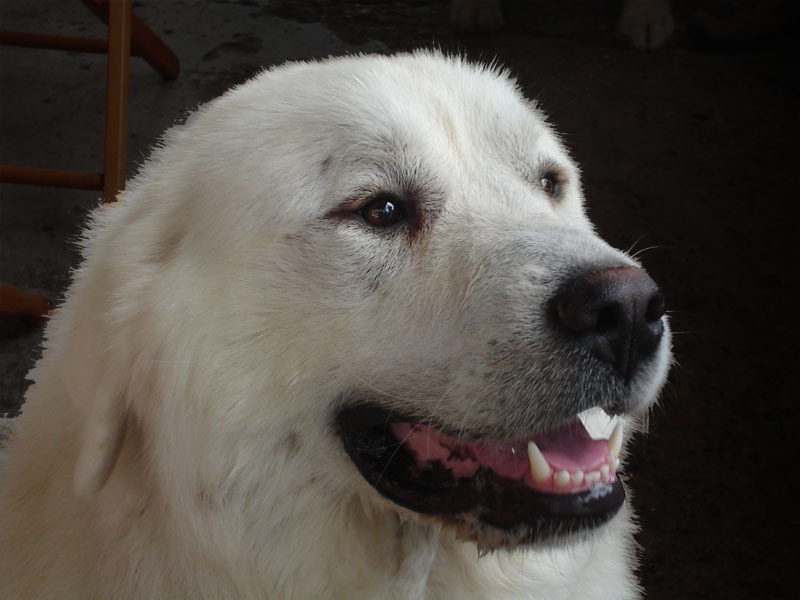 Asher passed away on July 19, 2015 with over ten years of guarding service. 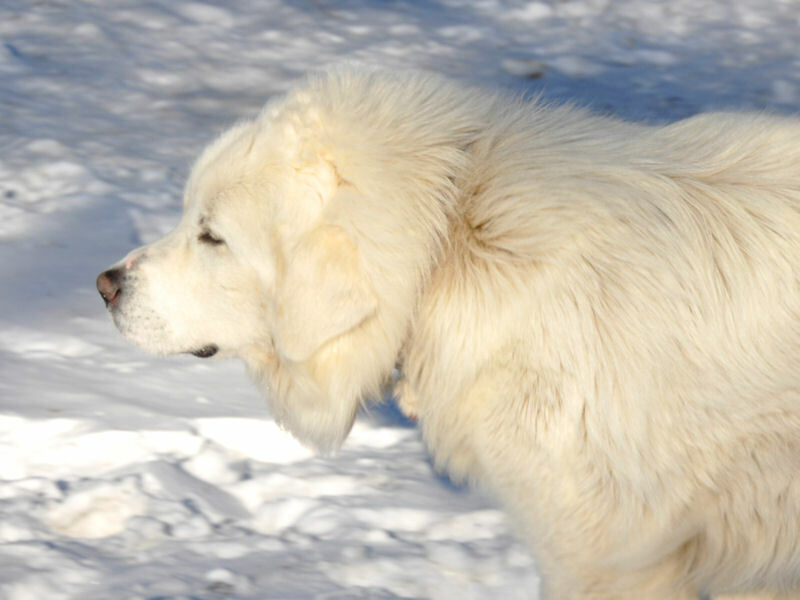 Jessie is all white and one of the Grand Pyrs of Boomer, Kodi, Baron and Molly Brown. She is very gentle, licking the ears of the newborn lambs. Sarah likes to take her on her daily walks. Jessie is a good mom and has strong healthy puppies. 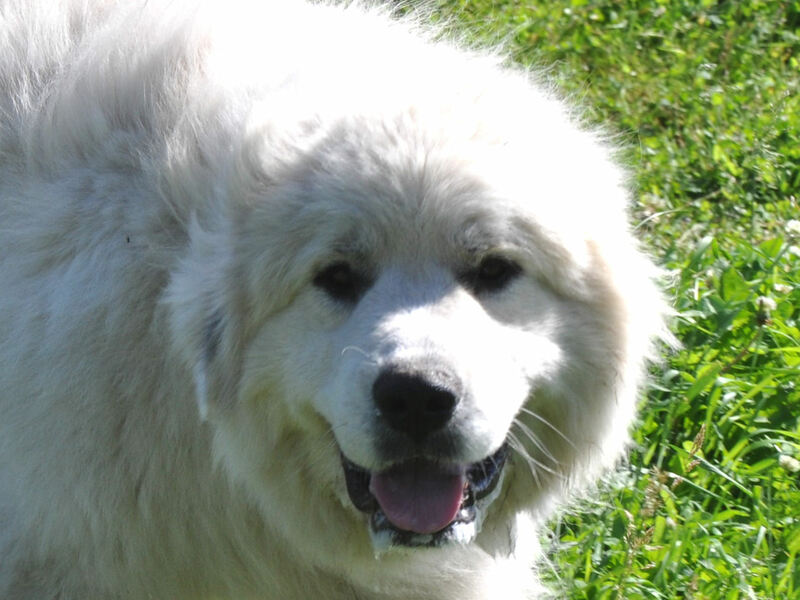 Jessie was retired from breeding in 2012. 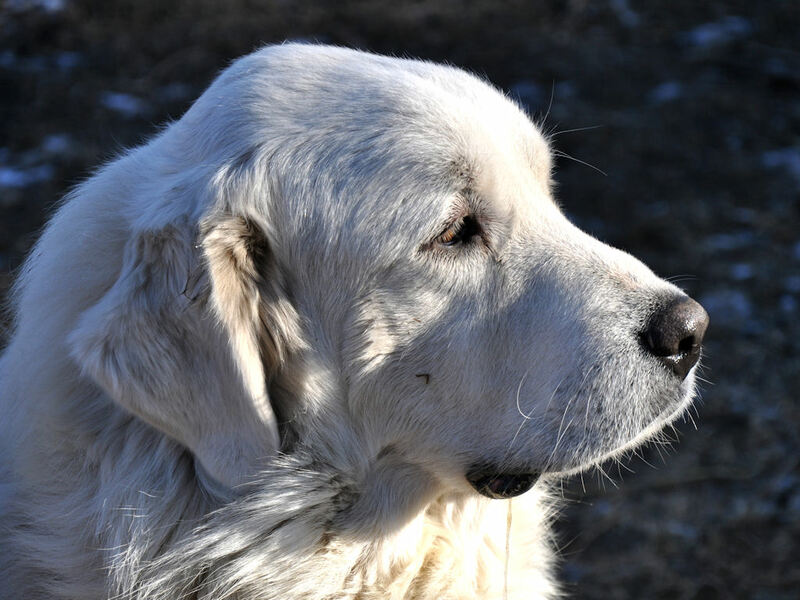 Jessie passed on September 23, 2018 with over thirteen years of faithful guarding service. 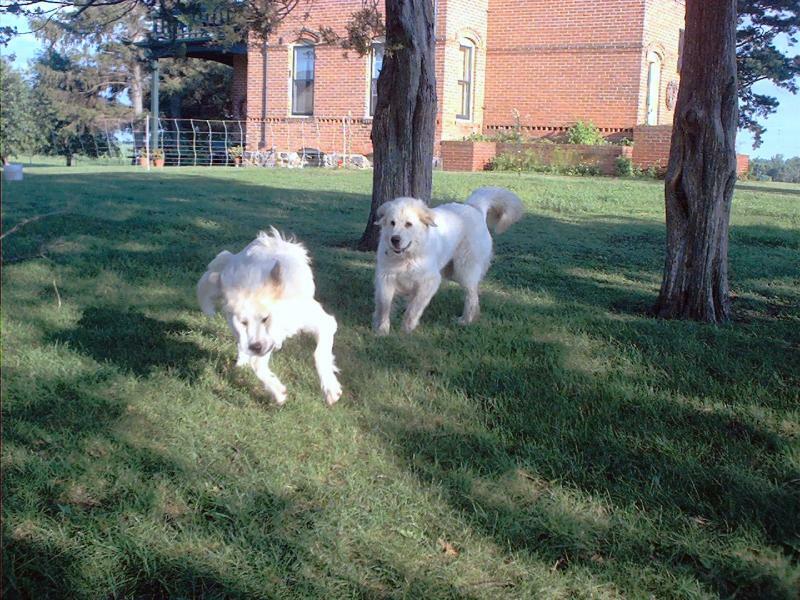 Josie is lightly badger marked and one of the Grand Pyrs of Boomer, Kodi, Baron and Molly Brown. 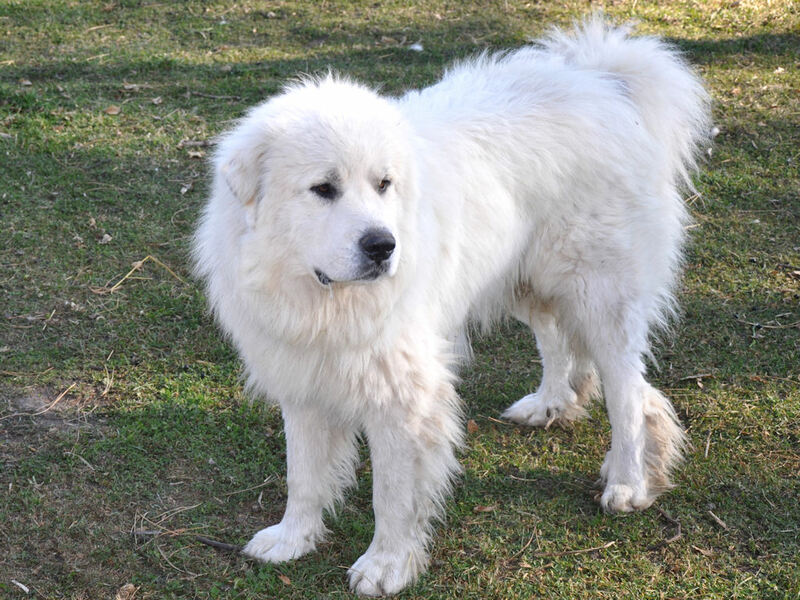 She spends a lot of time in the pasture and is a good guard. 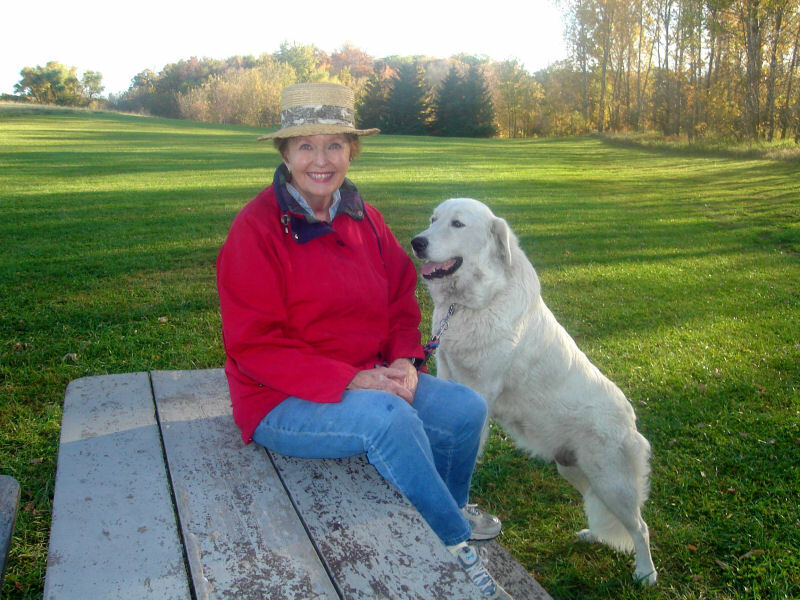 Josie passed on July 18, 2015 with over ten years of guarding service. Ginger and Pepper are pictured on the left as 10 week-old females. 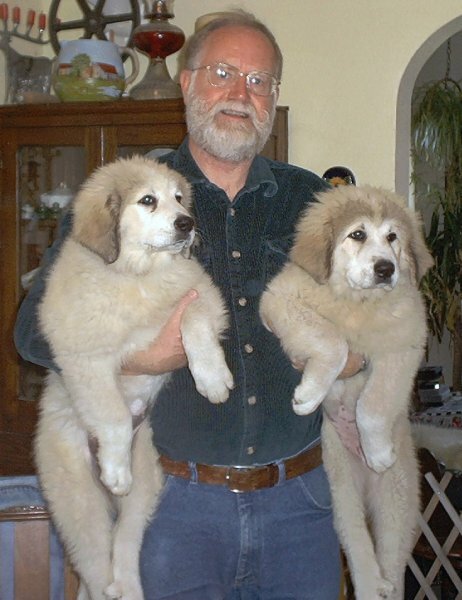 We bought them from an excellent breeder out of state, and had to drive 700 miles to fetch them. It was worth it! 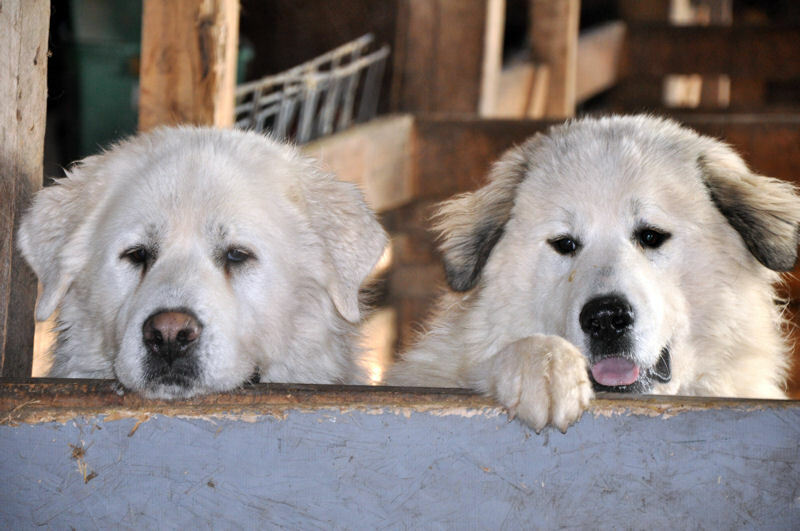 Pepper was sold as a guardian and Ginger is an excellent mom. She is watchful and puts a lot of energy into her guardian duties. 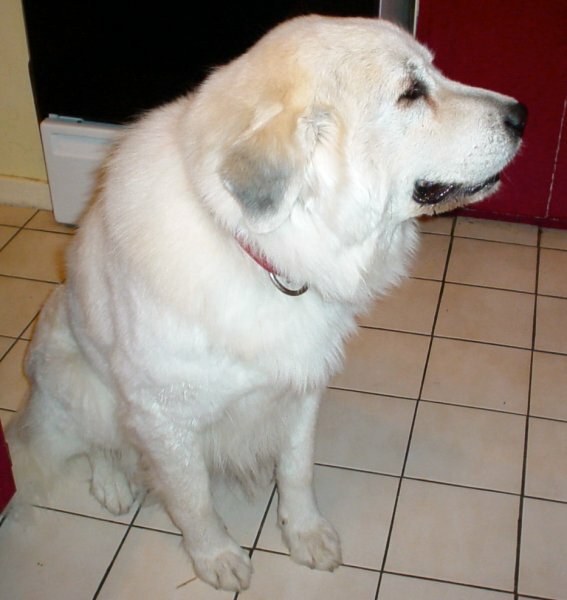 She often will notice something out of the ordinary and bark to alert the other Pyrs. She is passing on her guarding duties to Mocca, her daughter. 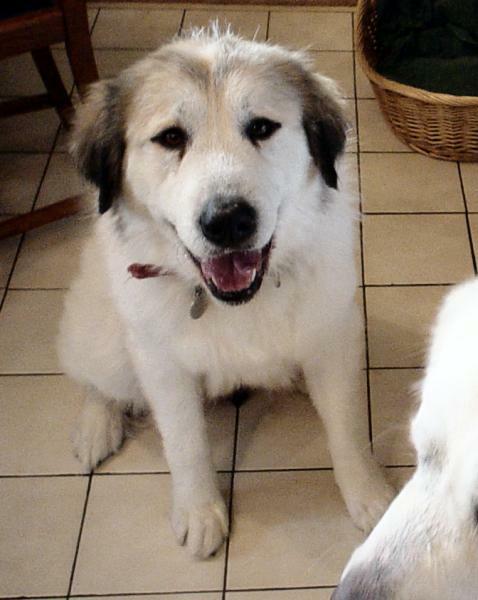 Ginger passed away on August 3, 2013, just over twelve years old. 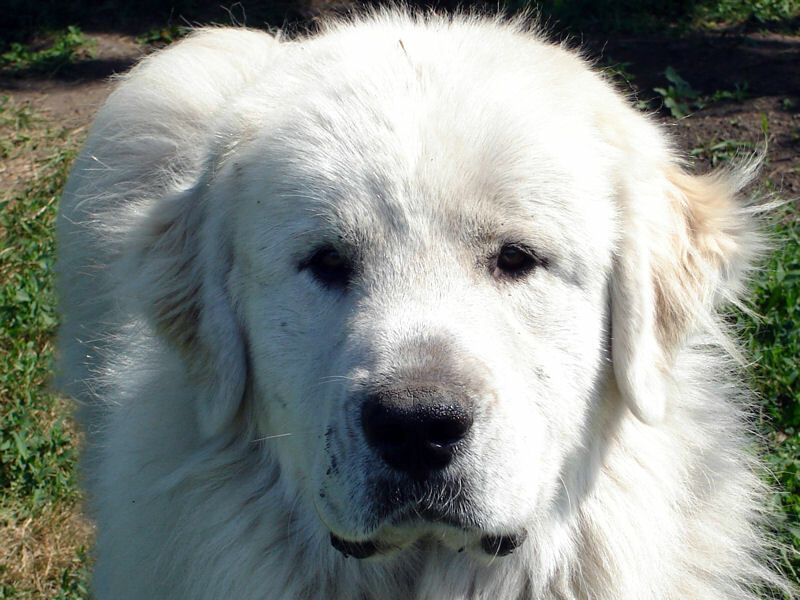 Baron is strong, alert, and has a great attitude. 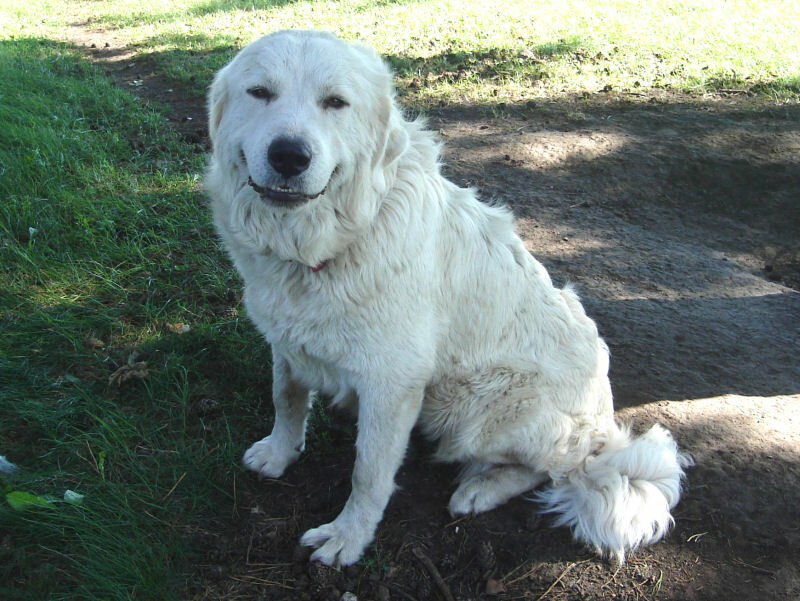 He always looks like he is smiling (except when doing some serious guarding). He carries his beautiful tail high looped over his back and has a distinct bounce in his trot. 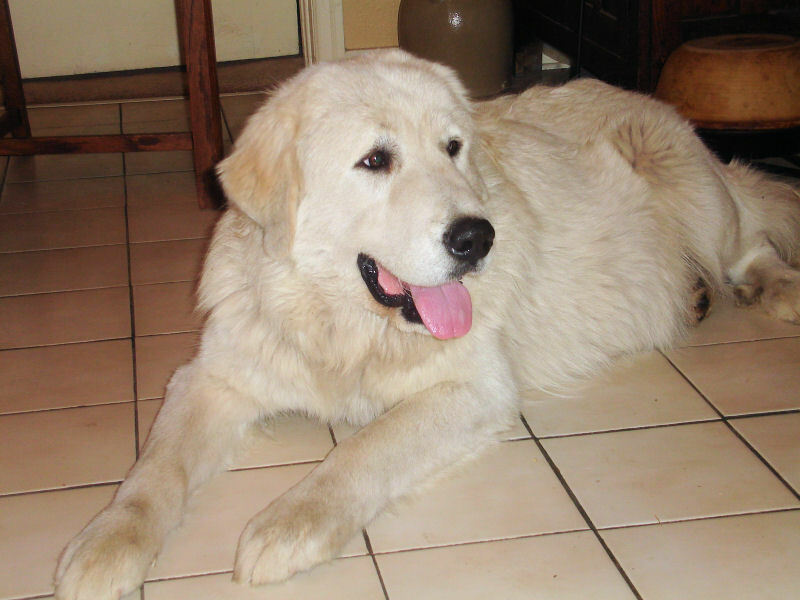 Baron is very attentive to commands and is SMART! Nothing gets by him. 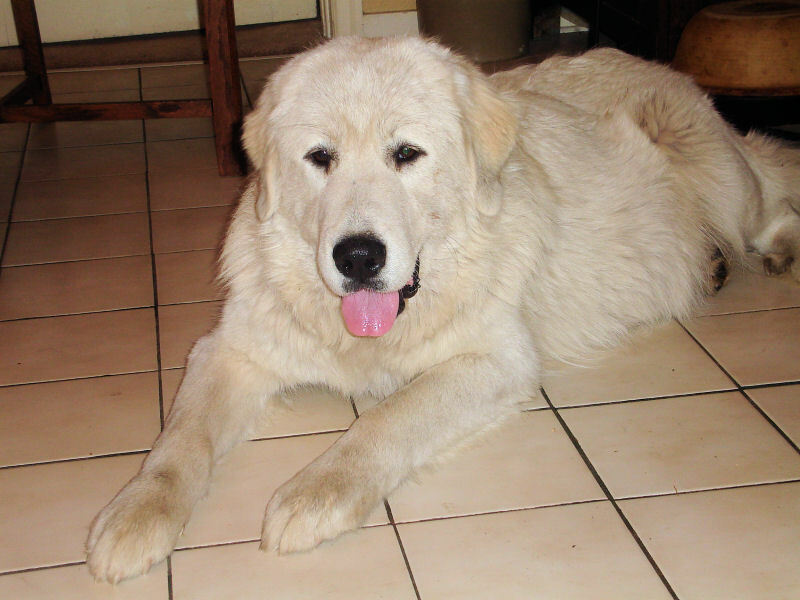 Sizewise, a year makes a big difference as you can see in the puppy picture with Sarah and his one-year old picture. Baron is also the Sacco cart puller. 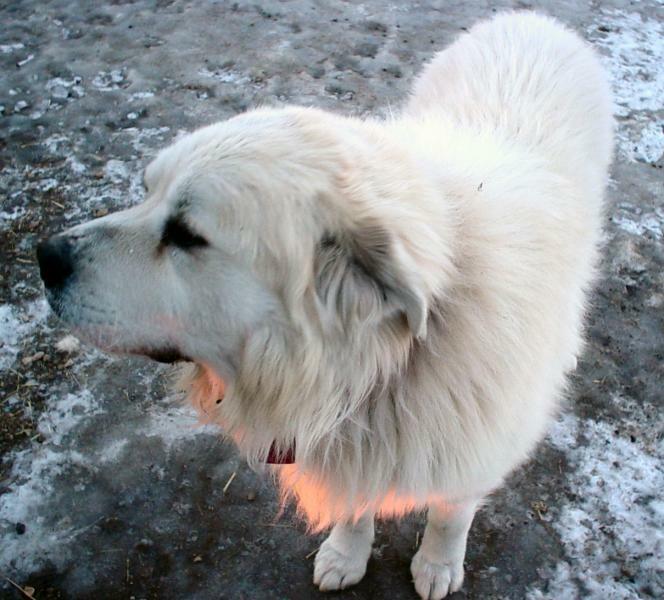 Baron passed away July 28, 2011. Tesse is the daughter of Jessie and Asher. Tesse passed on August 4, 2017, just over 11 years old. Sunday - Sunday is the daughter of Asher and Jessie. She is very friendly and alert. 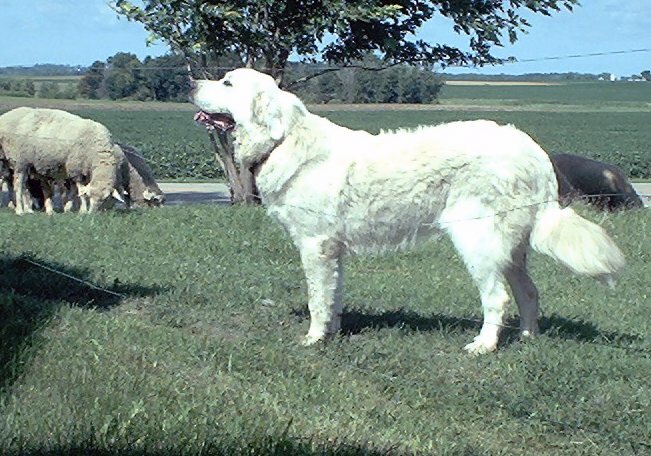 She has been guarding the sheep and lambs. Sunday started out pretty cute (picture on the right). Milk and Honey Farm is happy to present Gracie. 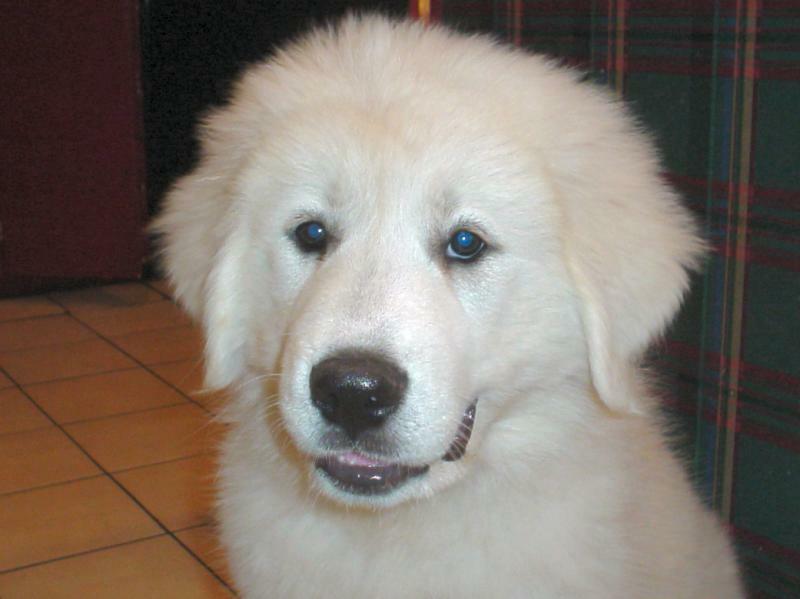 Her official AKC registered name is "Amazing Grace of Milk and Honey Farm". 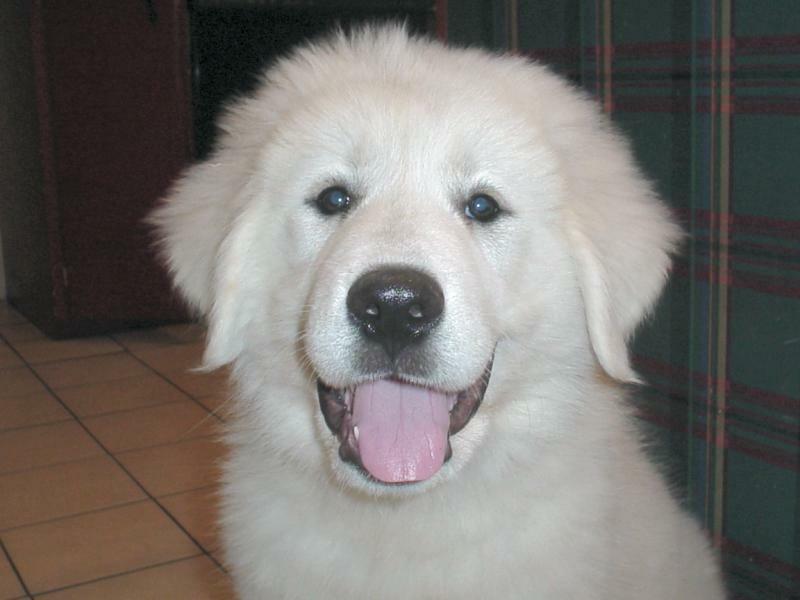 Gracie was born on July 20th, 2004, to Molly Brown and Baron. It was love at first sight. 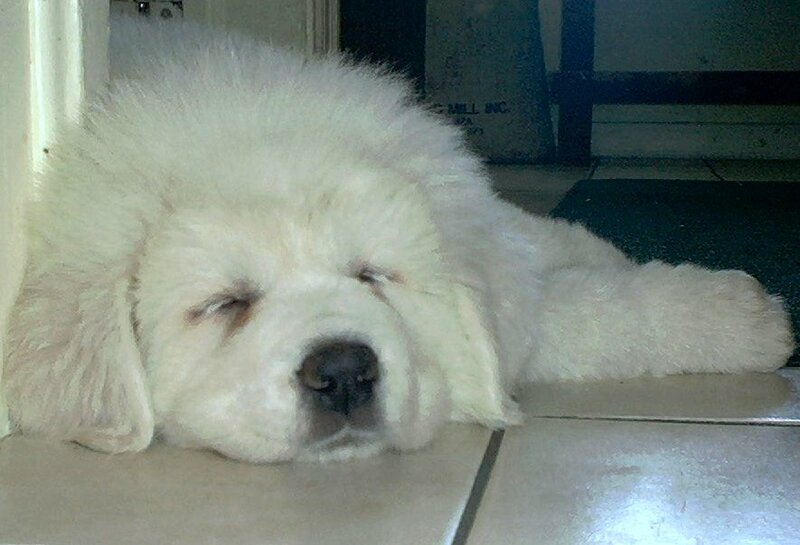 I have been thinking about keeping an all white female pup from Molly for a long time. 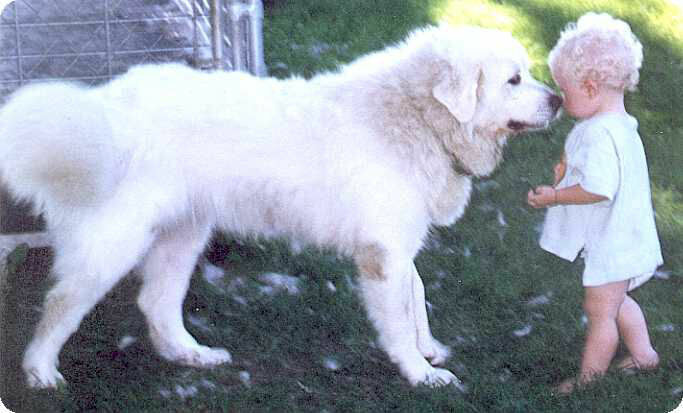 I was there when she was born and I knew right away that this was MY puppy. What makes Gracie so special is her smile. She is a happy girl and it shows all over her face. She kept the smile until her passing day on June 9, 2017, just a month short of 13 years. Shiloh comes from Missouri where both her parents are goat guardians. 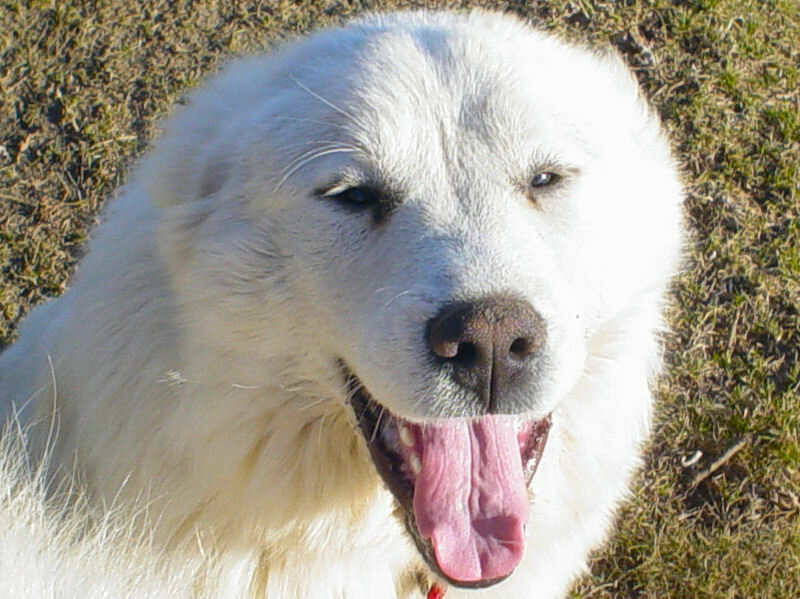 Shiloh is our largest female Pyr and has a very mellow, friendly personality. 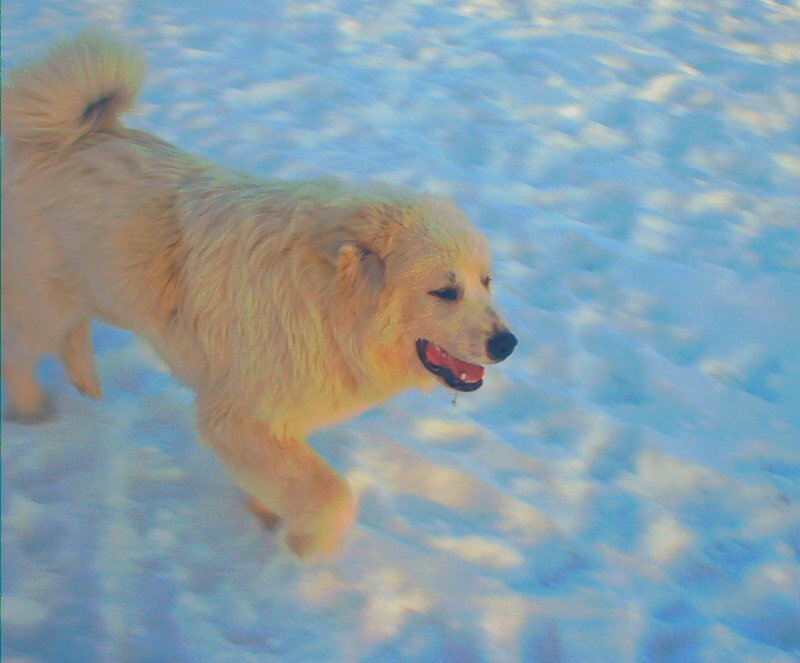 Her white coat is thick and beautiful. 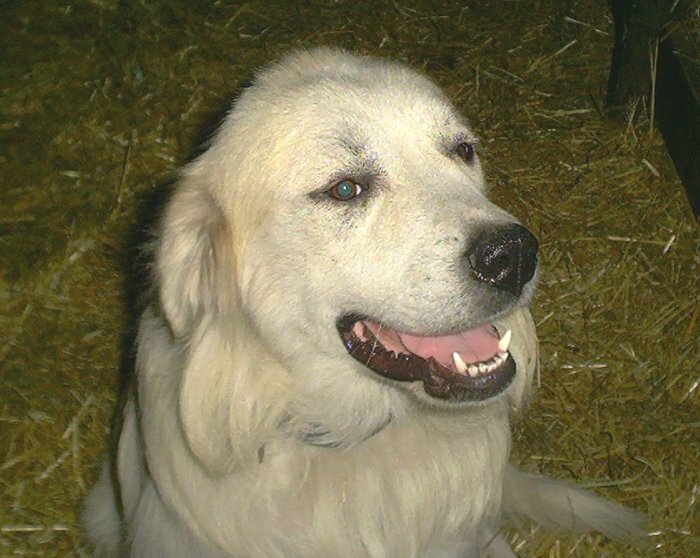 Shiloh passed away September 30, 2011. 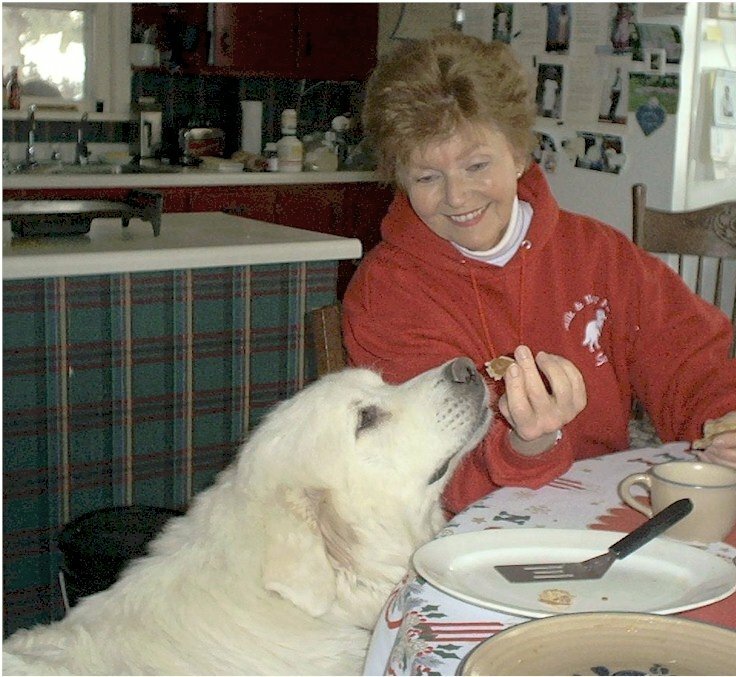 We will miss her smile and her doggie 'leaning in' hugs. Honey Bear is a "Big Mamma". She loves children (she was six-months old when this picture was taken with Grandson Joshua) and takes her sheep guarding very seriously. 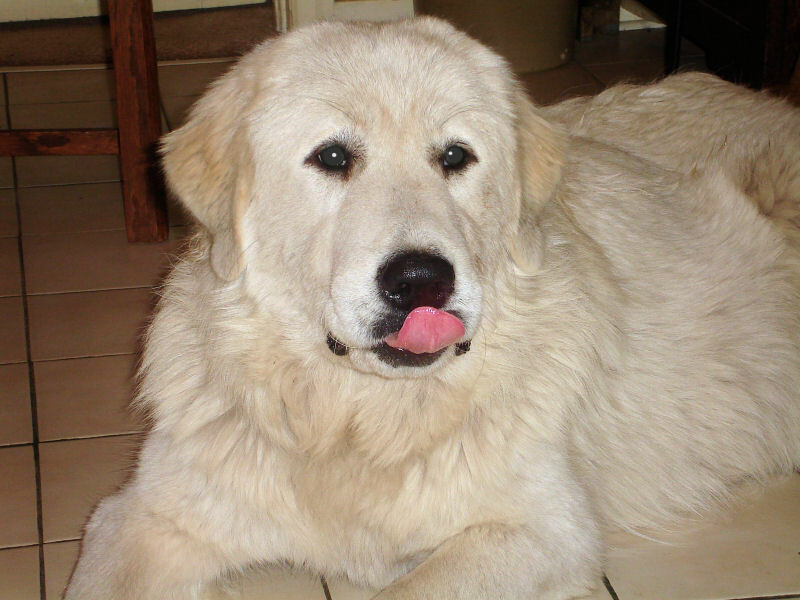 Honey Bear has excellent house manners and likes to spend time in the kitchen watching Sarah cook. 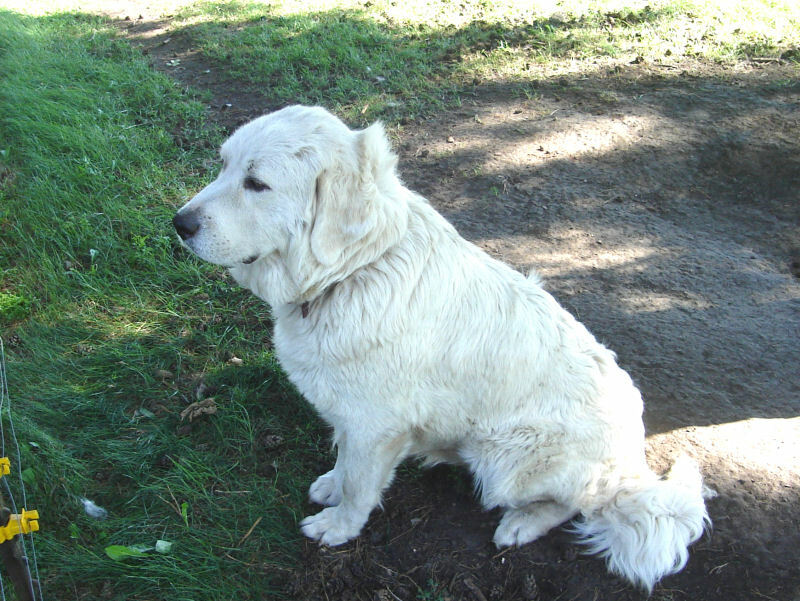 She is the most photogenic of our Pyrs, having a luxurious thick white coat. She has retired from breeding. 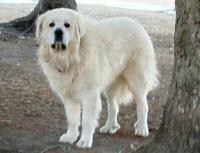 Honey Bear left us on July 11, 2010 after closing in on fourteen years old. 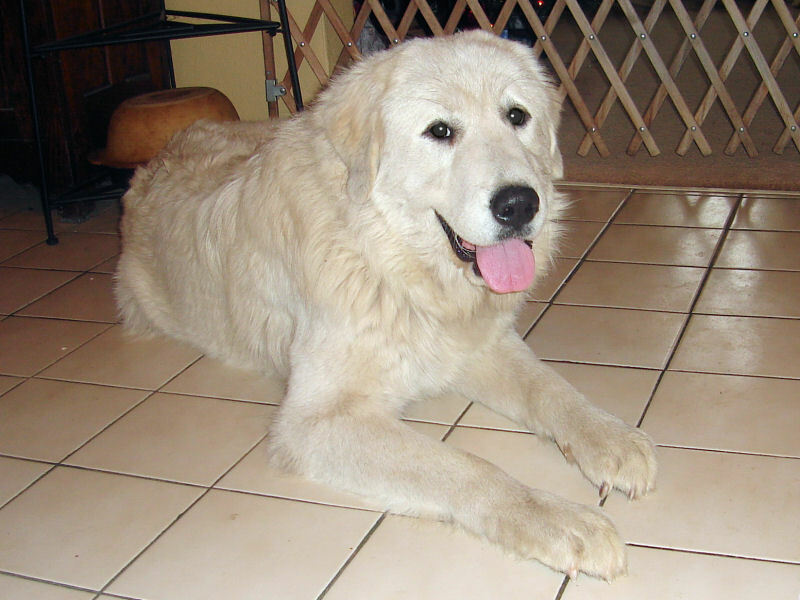 Molly Brown is a large female and very loveable. 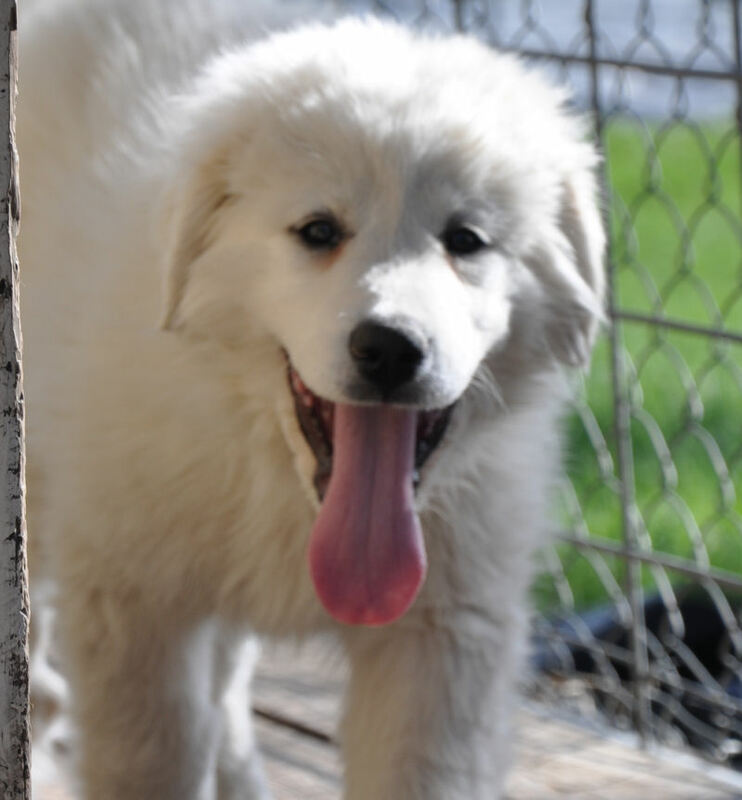 She has the long, lanky body type and badger markings We recommend Mollies puppies for those folks who want a livestock guardian. 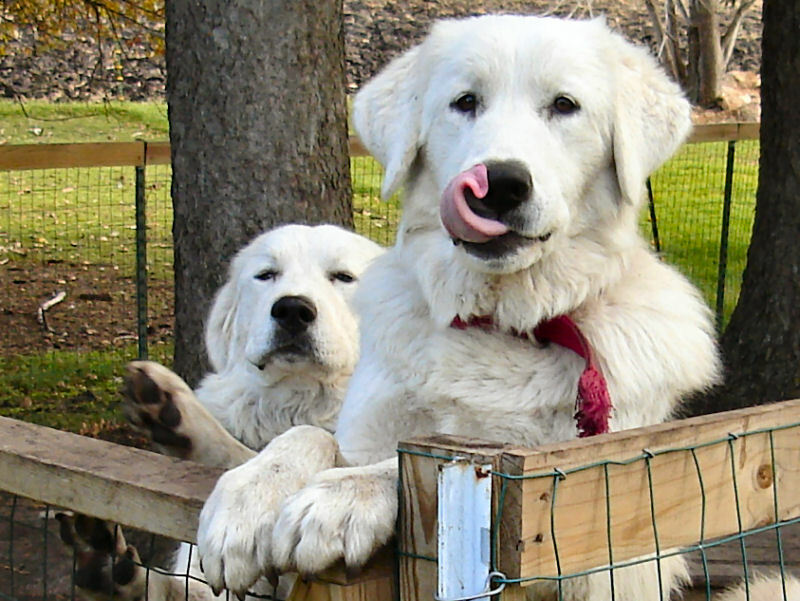 Her puppies (now grown) are guarding cattle, sheep, alpaca, and llama herds all over the United States. 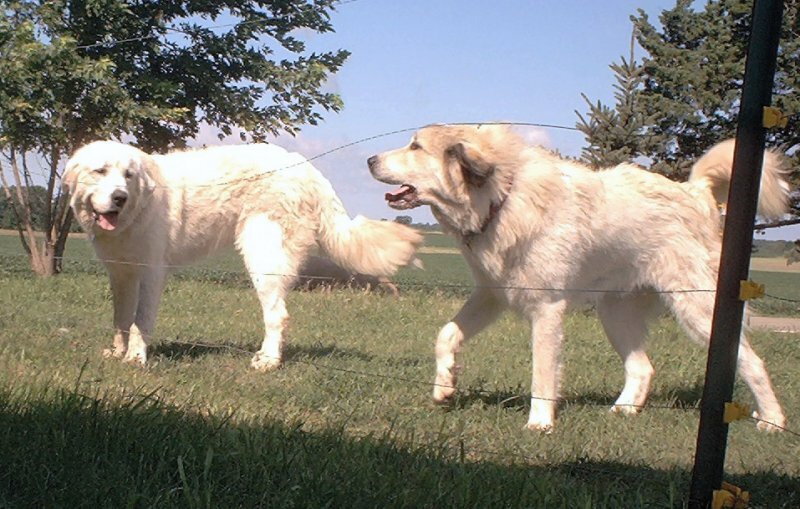 A recent report from Colorado confirms that one of Mollies seven-month-old pups chased coyotes off of a cattle ranch just south of Denver. 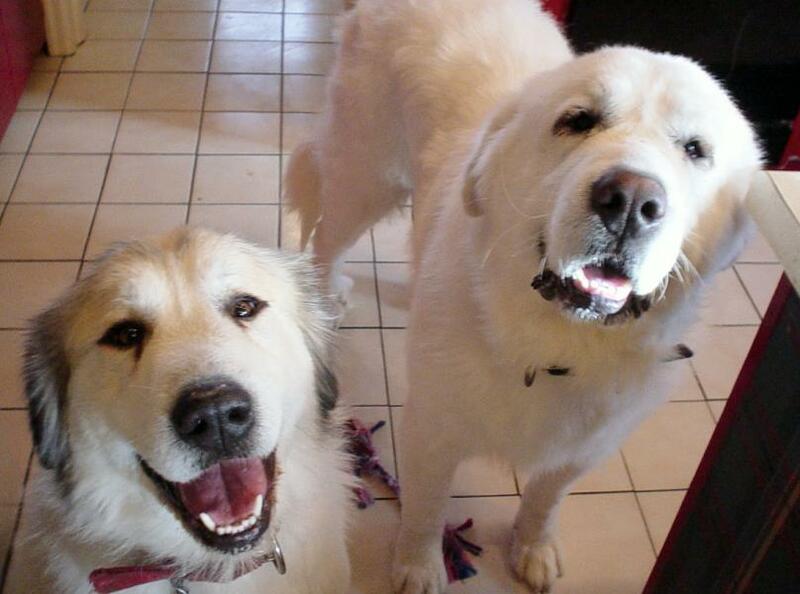 We received a phone call from the owner and he wants to buy another of our pups! We took Molly to the local nursing home last May and the old folks just loved her. She is just the right size to put her head in a lap of someone sitting in a wheel chair. Molly passed on October 14th, 2010 after a long life of over twelve years. Boomer , the oldest male, takes care of business. He has free range of pasture and barn. 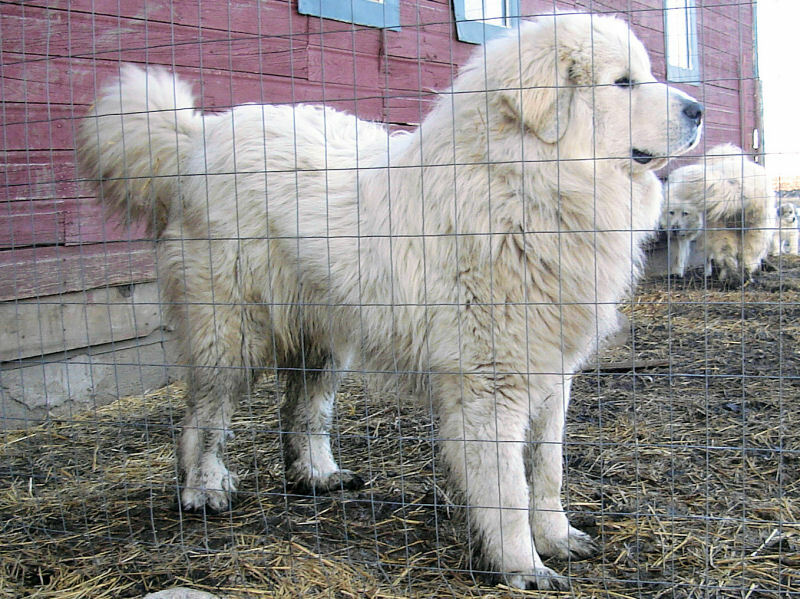 He guards the sheep, lambs, geese, ducks, chicken and assorted barn cats. He is very gentle with all the animals and we do NOT have a problem with predators or intruders. He prefers to sleep outside to sleeping in the barn. The cold and snow of Minnesota winters do not bother him at all. 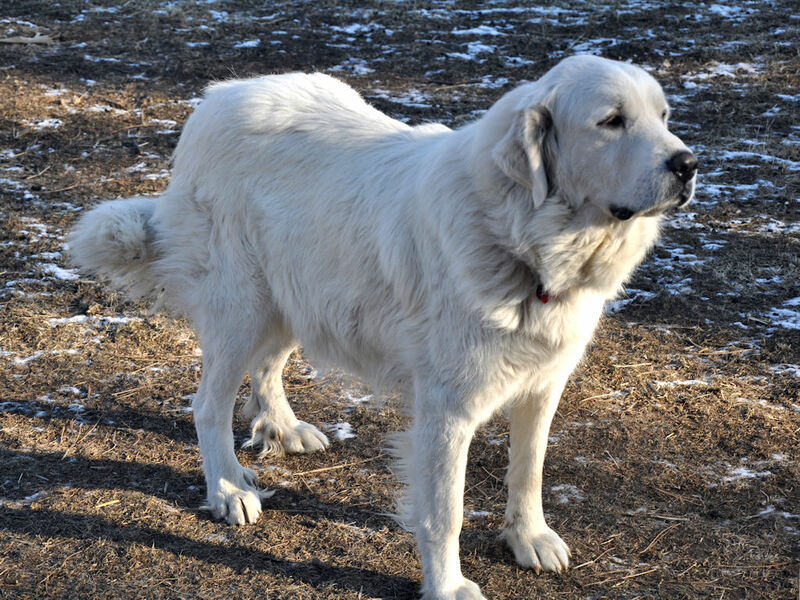 Boomer is watchful and alert both day and night. We sleep soundly knowing that he is out there! Sarah loves to take him with her to the park. He likes the woods and lake and takes good care of Sarah, too. 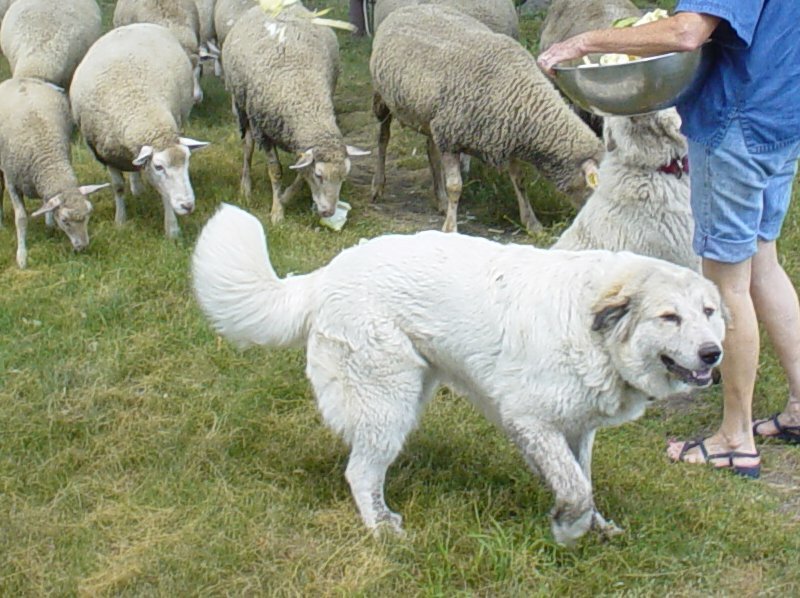 On August 21, 2009, Boomer positioned himself directly in front of the sheep gate, laid his head down and passed on his sleep. He would have been 14 years old in October. He leaves behind thirteen years of continuous guard service and friendly greetings. We dearly miss him and he leaves behind big paw prints for Asher to fill. 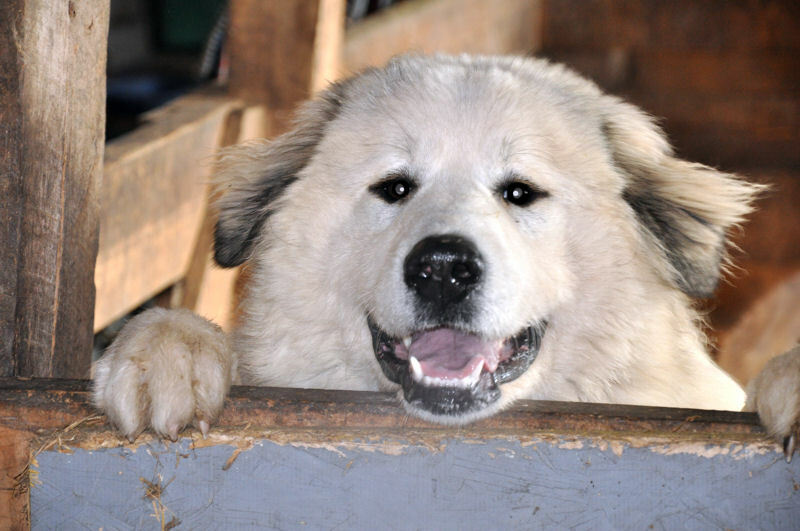 Kodi (short for Kodiak Bear) comes from East Texas were both her parents were cattle guardians. She takes to guarding the sheep quite naturally. She is fast and lean - a great body shape for chasing coyotes. 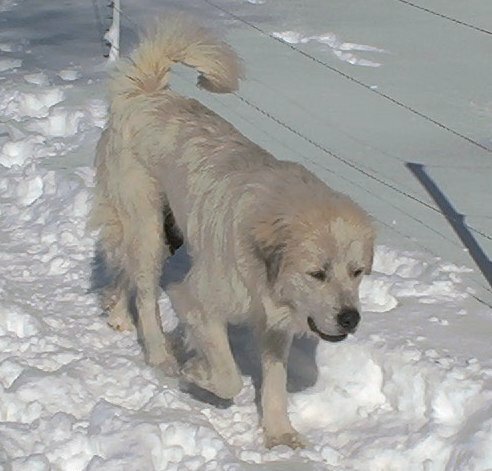 Kodi is "on patrol" all the time - quick to notice a noise or movement. She is an excellent and attentive mom. 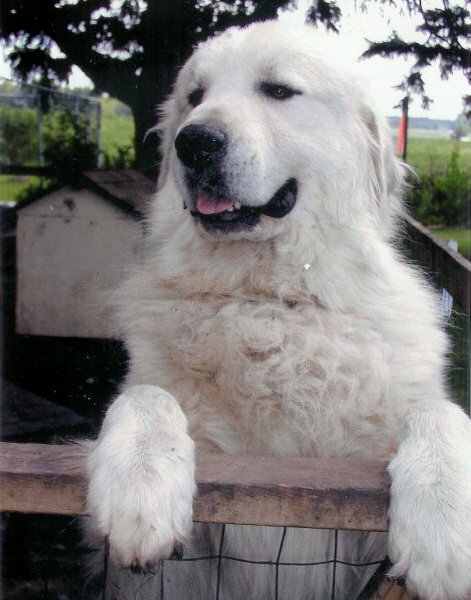 Kodi was retired from breeding in April, 2005. 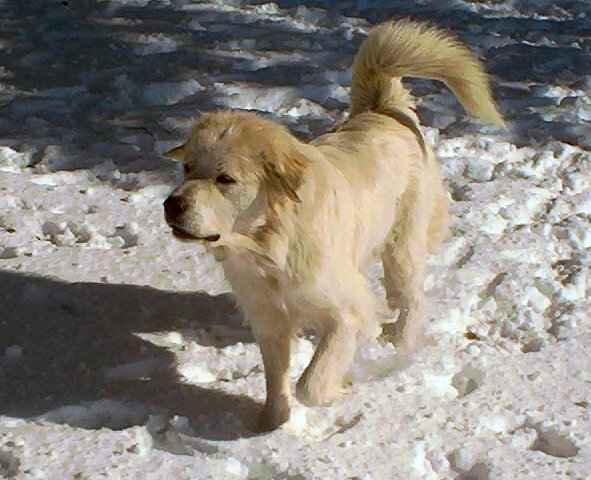 Kodi died on November 4, 2008. I was out in the barn doing morning chores and found her. She was peaceful looking and just had gone to sleep. 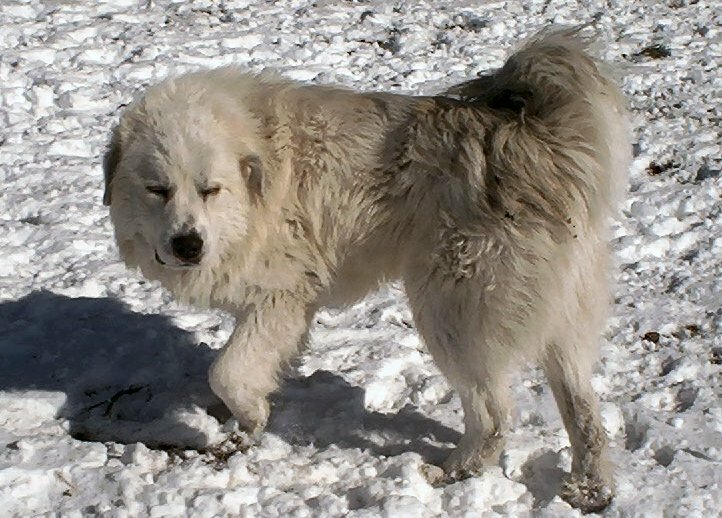 Kodi was in the area next to the sheep. It was as if she was watching them as usual and just drifted off. 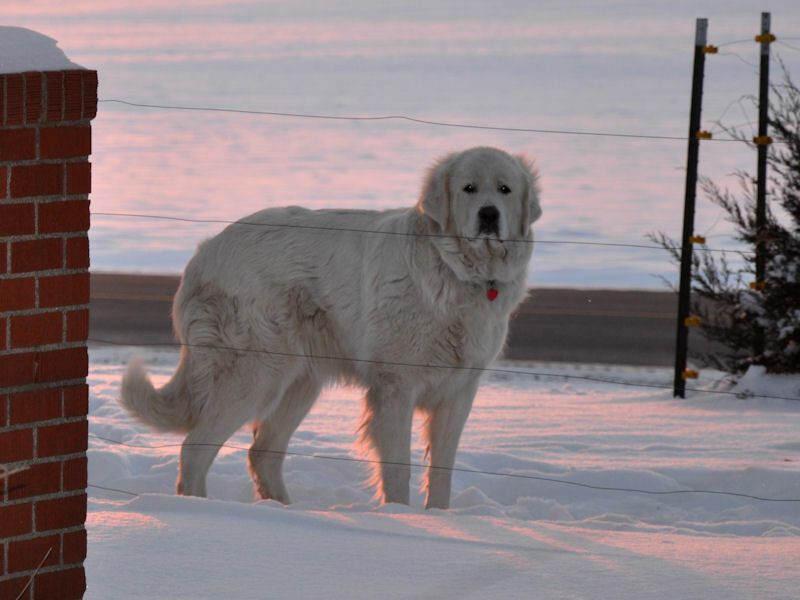 She was the first and foremost guardian at Milk and Honey farm for a long long time. 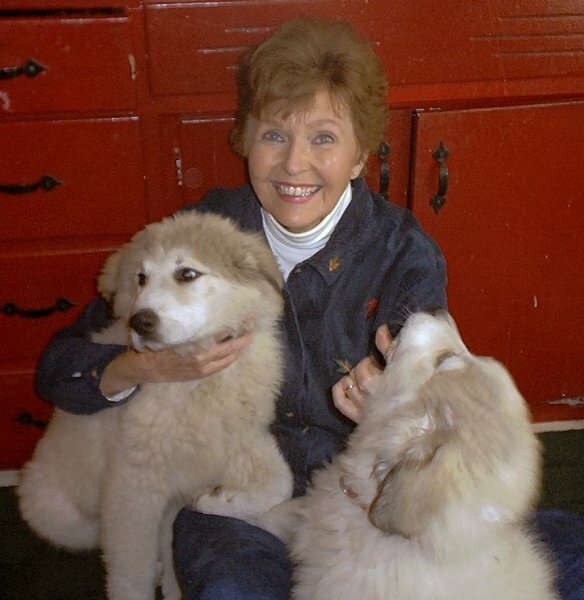 Before being retired from breeding in 2005, she had given us many beautiful puppies. 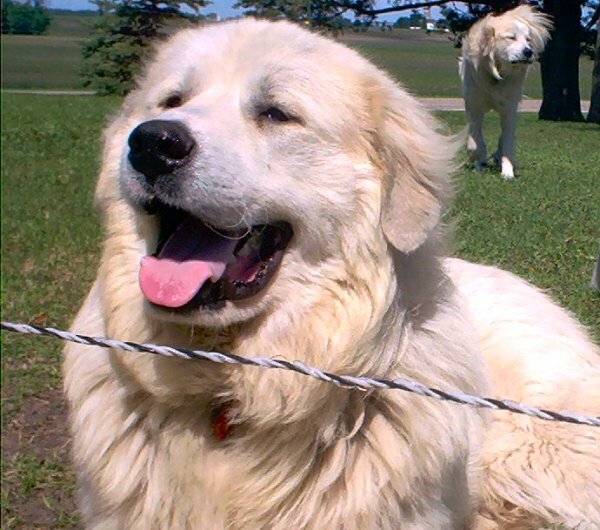 Kodi was a good Mom and a great guardian. She will be buried here next to Bella, out behind the barn. 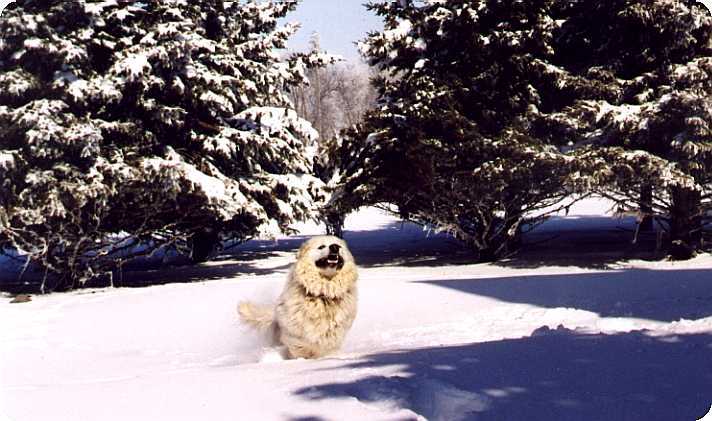 To everything there is a season and today is the end of Kodi’s time. 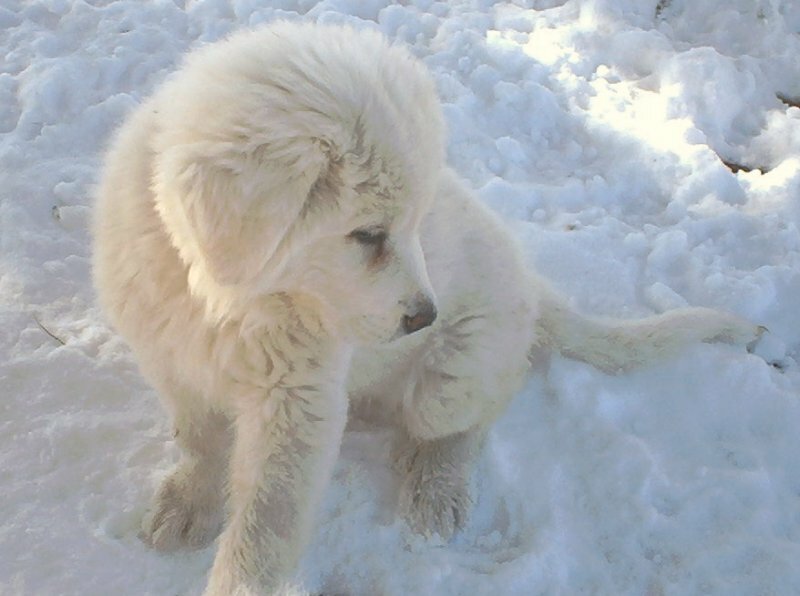 We brought her to the farm when she was seven-weeks old. Her parents had come from Texas and were guarding cattle there. She loved her life and all that came with it. 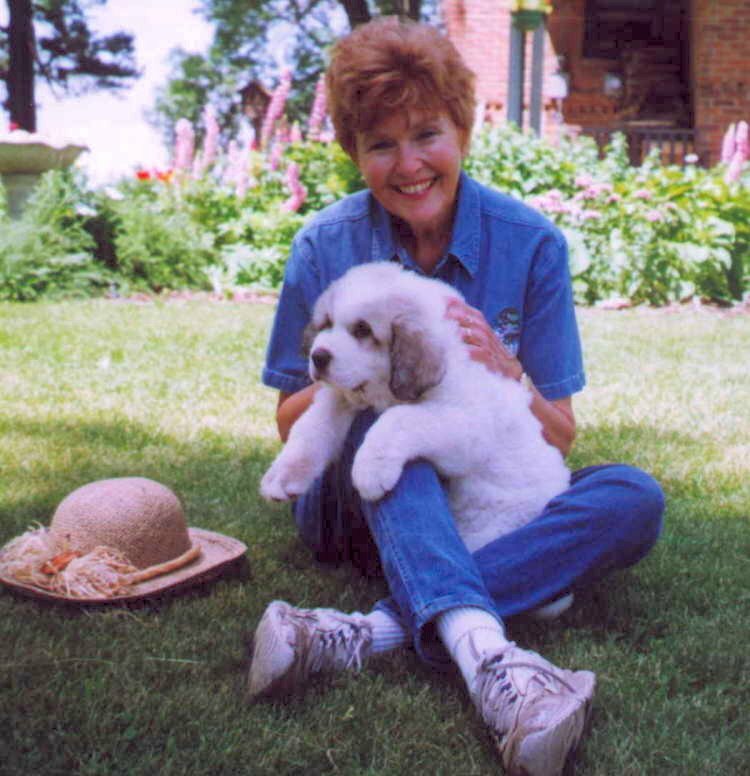 She kept our sheep, chickens, ducks, and geese safe from predators. In the last few weeks, Kodi had a new friend. It is a calico kitten. I would often see them curled up together taking an afternoon nap. I think the kitten must have known that he was safe, sleeping next to Kodi. 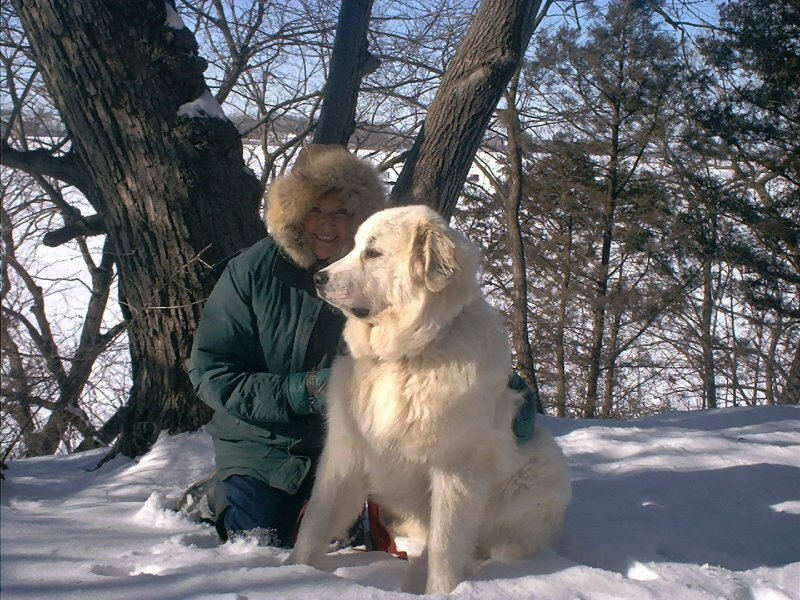 She was a good dog and a wonderful example of all that is so special about the Great Pyrenees. We will remember her with smiles and we will miss her. 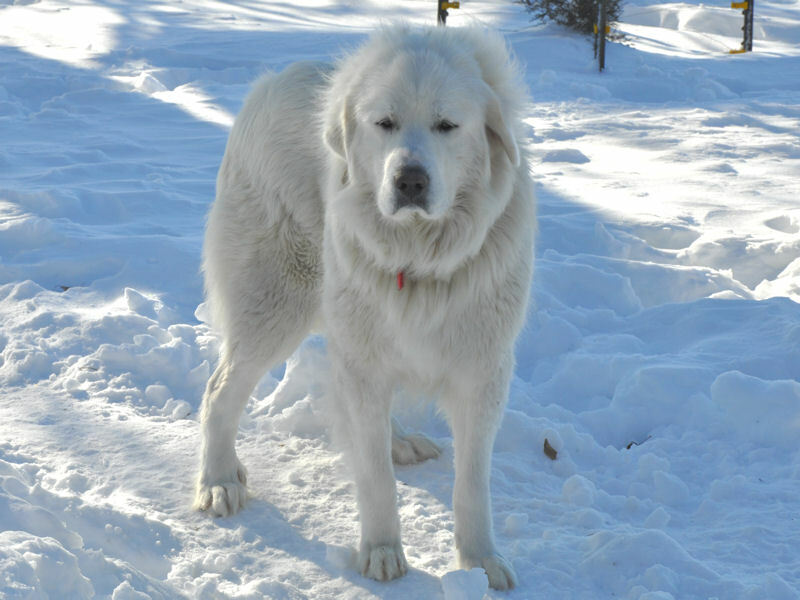 Bella is a lightly badger marked and one of the Grand Pyrs of Boomer, Kodi, Baron and Molly Brown. She has the run of the pasture and is a good guard. Bella and Josie look almost identical and it's hard to tell them apart. 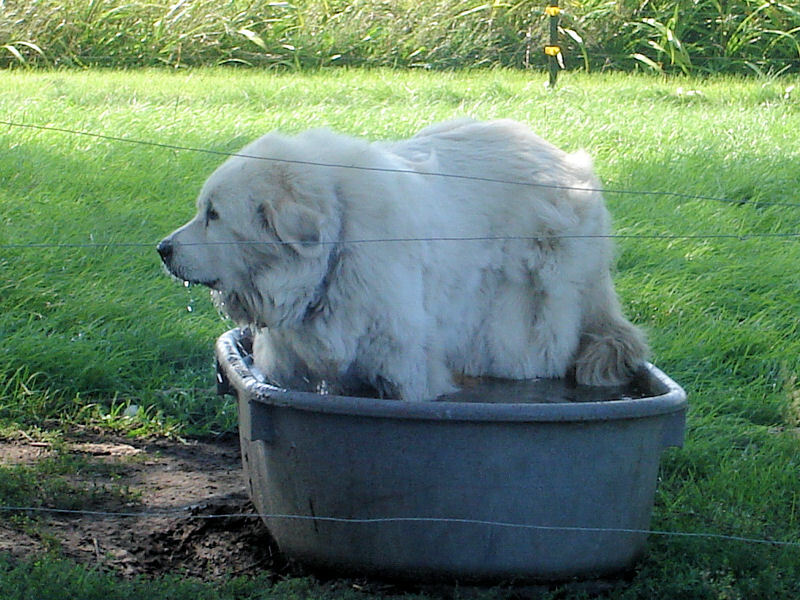 We really enjoy our Great Pyrenees. 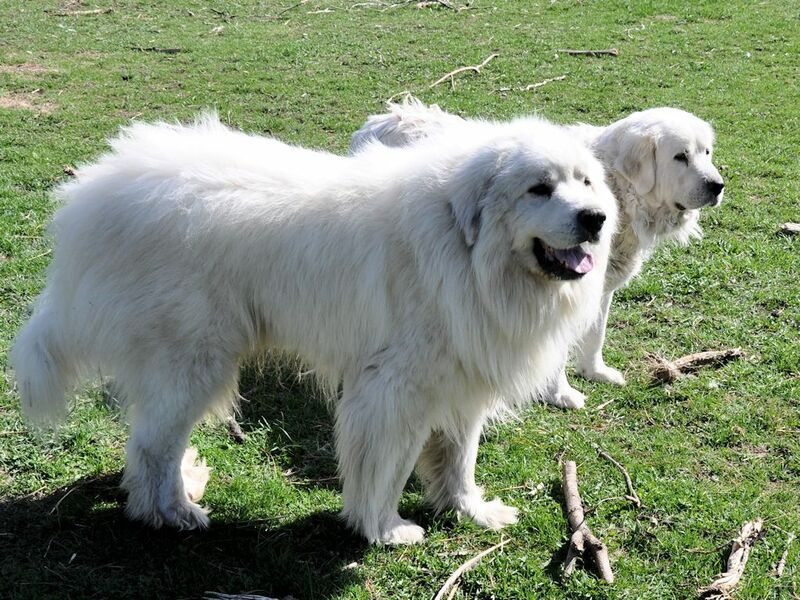 Each one is special and rather like "family" We hope this gives you some insight on our dogs and what kind of puppies we raise here at Milk and Honey Farm. For more information, you can call and visit with Sarah. Content Copyright © 2001-2018 Milk and Honey Farm. All Rights Reserved. Web Design Copyright © 2001-2018 Milk and Honey Farm. All Rights Reserved.